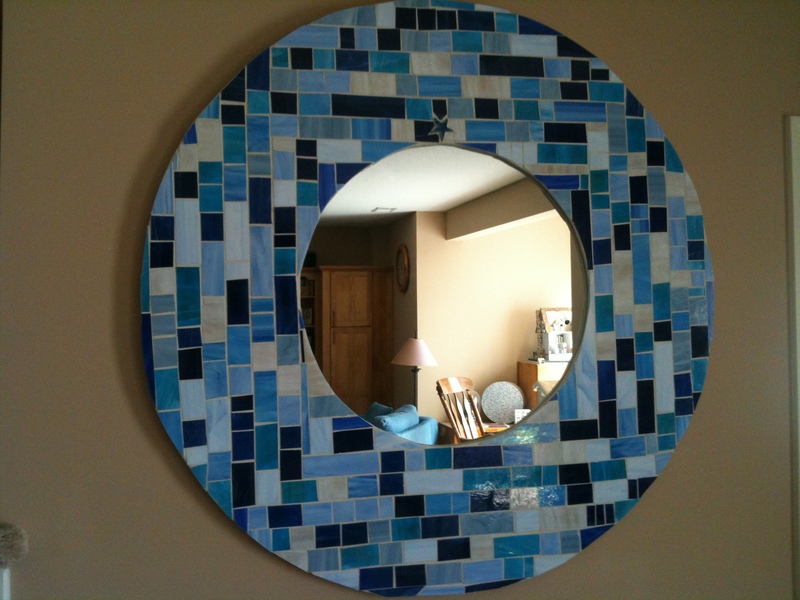 Round mosaic mirror in shades of blue. Once I finished my crafting supply cabinet last night, it didn’t leave me with much time to really get anything new started, or get anything else finished. So I will continue to showcase some of the more recent projects that I have tried my hand at. One of my favorites is this mirror. I had always been fascinated with stained glass, but there always seemed to be more skill and initial cost than I was willing to invest without access to someone with talent and experience that I could ask questions. But my interest was piqued with the prospect of using glass for a project. So I decided to start with mosaics. A huge portion of my basement has been finished into a movie viewing room. Well, that is what is was initially, but has steadily been taken over my teenager. It now houses his video games systems – Wii, PS3, PS2 as well as his toys. But there is a beautiful wall-to-wall media and storage unit that houses a huge television and media system. In front of this is the pieces that set the decorating tone for the whole room: a denim sectional sofa. So when I decided that I needed some wall art and wanted to do this mosaic framed mirror, I wanted it in shades of blue that would match the denim. This was easy to accomplish, as it seems there are literally thousands of shades of colors in glass… and it seemed I wanted it all! I finally settled on a range of blues and would use white grout. I then cut a large circle out of a piece of plywood and the inside circle as well. I had a round mirror that I got from some yard or garage or estate sale, so I cut the inner circle just slightly smaller than the mirror. I set about strip cutting the glass and then random pieces from these strips. It was just all trial and error until I liked the design. I started at the bottom and worked my way across. Then would turn the whole thing a quarter of a turn and again, lay the glass across the bottom. I love the way it turned out, randomly planned. I had this one glass star that I had picked up somewhere that just seemed perfect at the top. Gave the mirror an “up”. Once the mastic dried, I simply used some leftover tile grout (and the grouting tools) that I had from laying the bathroom tile and grouted the whole thing. Honestly, I bought flexible trim to wrap around the edge of the mirror, but while affixing the glass with the mastic, I managed to slop it over the edge, so I continued that all the way around and liked the way it turned out. So I left the trim off. I am not exaggerating, this piece is heavy! It requires some heavy duty hardware to hang it and it had to be hung on a stud. If I had to guess, this was at least 50 pounds, maybe heavier. I didn’t want it crashing down some night and damaging everything in its path. So, if you decided to do this, take care in this final step. This mirror actually hangs opposite of the media center and above a beautiful stereo console from the late 50’s or early 60’s that I picked up from another estate sale. I will probably showcase this piece in another blog entry. I have a habit of trying to recapture things that I had a fondness for as a child. The stereo console is one of those pieces. I remember having just such a piece in the hallway as a child and I would put Skeeter Davis on the record player and sing up and down the hall like it was my stage. I still know all the words to “It’s the End of the World”. Well, thanks for coming back and checking out my crafting. Over the years, I have tried and been successful at many things, but only fell completely in love with a couple of things that I wanted to do more than once. So my house is full of one-off projects. Makes things fairly eclectic but that’s okay, because I love it.